Right now, I'm writing from the Bella Center in Copenhagen, where tomorrow the 15th Convention of the Parties of the UNFCCC will commence. We're waiting for Susan to get here, and then we'll start setting up our exhibit space. We just met up with some of the Dickinson students and their instructor, Sarah, for the first time. Our one-star hotel, Euroglobe, lives up to its description. One star. But it's all part of the adventure. Speaking of adventures, I finished my first day in Copenhagen by getting locked in the shower. It appears the lock on the shower stall's solid wood door has a tendency to jam. I tried to wiggle it myself for 15 minutes before finally succumbing to the more obviously pitiful response and screaming for help. Luckily for me, a young gentlemen came to my rescue and my robed self was finally able to escape. Okay, back to the beginning. After arriving to the hostel at about 9 a.m., we had the rest of the day free to explore the city of Copenhagen. My former neighbors in my hometown of DuBois, PA (Jes and Colleen Nielsen) are originally from Denmark and moved back here nearly three years ago. They came to the hostel to welcome me, and took me on a tour of the city. It was so nice to see a familiar face, and to reunite with them after three years. We strolled around the city, with Jes pointing out the planetarium, Tivoli Gardens, the town hall, famous churches and statues, New Kings Square, the pedestrian streets for shopping, the Copenhagen Opera house, and the Queen's palace protected by the Royal Guard. On our way back to the hostel for a class meeting with Susan and Rick, we again passed the Guard, marching in the direction of the palace for noon's changing of the guard. Interestingly, the music they played on their drums was a Christmas carol. We then came to the Bella Center as a class to get our UNFCCC badges, which permit you access into the Conference. Well, ideally at least. As soon as we got our badges (side note: my name is spelled wrong. How hard is it to put an 'h' in Meghan, honestly?) we continued walking to the area where we were told to pick up our travel concession card, which allows us to take the Copenhagen public transportation system for free. However, we were quickly approached by a uniformed guard who asked us to follow him -- and then promptly showed us to the door. That's right -- not even the first day of Conference and already we were thrown out! As it happens, they were still setting up the Conference and simply weren't ready for us to be allowed in. So, off we went -- no free Internet access, and no free transportation. The metro is quite expensive here -- everything its quite expensive here. However, the people are friendly and the sights are beautiful. Around 4 p.m., Jes returned and took me to his and Colleen's home. Colleen had prepared a traditional Danish supper -- pork roast with crackling (essentially, crisp outer skin of the pork which tastes a bit like pork reins), potatoes (cooked whole), homemade gravy, red cabbage (a dish made of exactly that, mixed with Port wine and having a taste slightly similar to Sauerkraut), and cucumber salad. It was delicious -- she's quite the cook. The three of us Skyped my parents, who are closer in age to Jes and Colleen. They were close friends, and my parents miss them very much. It was so nice to catch up with them and learn more about the Danish language, Danish culture, and their opinions on both climate change and America's debate over public health care (which the Danes don't understand at all -- they have public healthcare and can't imagine a country as prosperous as the U.S. not wanting it. We know it's a complicated issue-- but most Danes don't seem to appreciate the argument). Well, it's about time for the rest of the class to arrive. Today we're meeting with an Environmental lawyer with a strong knowledge base of environmental issues pertaining to the Conference. In exactly 24 hours, our red-eye to Copenhagen will be taking off! It's hard to believe that our semester's work has finally reached the culminating point, and that we will soon be surrounded by United Nations delegates from around the world. In yesterday's class, we were paid a visit by a reporter from WENY-TV. They covered our story in the news! To watch the clip, check out the link in the sidebar. 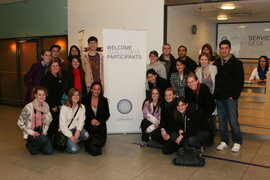 On our trip, we will also be accompanied by a few former Ithaca College students. Patrick DiCiaccio, one of these students, hosted a gathering at his house last night to watch the first Youth Clean Energy Forum, broadcast live on the White House's website. The forum was hosted by President Obama and attended by four of his cabinet members. I unfortunately couldn't make it -- I had some group project meetings and other homework to wrap up before our departure -- but I can't wait to hear about it on our long bus journey to the Newark airport tomorrow. I'll check in with you all again when we arrive in Copenhagen! Countdown to the Red-Eye Bound for Copenhagen! What do I have in common with President Barack Obama? While I would probably have said "Not much" before the beginning of this week, I'll now say this -- both he and I will be in attendance at next week's United Nations Framework Convention on Climate Change (UNFCCC) in Copenhagen, Denmark. Although we'll be there assuming slightly different roles, we'll both be there. The journey I've taken to get there doesn't just start with Friday's red-eye flight from Newark to Copenhagen. Over the past three and a half months, I've been one of twenty lucky students enrolled in the course International Environmental Policy taught by Dr. Susan Allen-Gil in the Department of Environmental Studies. Our group of twenty represents four of the five schools here at IC (Business, Communications, Health Sciences and Human Performance, and Humanities and Sciences). Although we're all studying different things in the pursuit of our degrees, this class unites us under one common mission: to learn all we can about climate change and the complex processes of international climate negotiations. Over the course of the semester, we've spent countless hours reading, learning, and analyzing scientific research, political policy, and opinion pieces on the science of climate change, the proposed solutions for the adaptation and mitigation of climate change, and international negotiations such as those about to take place in Copenhagen. We also each wrote a chapter of the book that our class produced, individually taking an in-depth look at a particular country or region's climate change policy. The book chapters also cover a wide variety of other topics including climate change in the media, sustainable architecture, and air travels impact on climate change. Since I had been studying abroad in Australia when I first registered for this class, I chose to write my paper on Australia -- a country who's position on climate change has changed drastically in the past year, and which has recently been making headlines in the news over the issue. 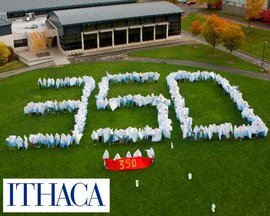 Oh, and those hundreds of Climate Caspers who took part in the 350.org Day of Action event here at Ithaca College? Yeah, our class was responsible for planning and facilitating that, too. We've also been planning the logistics of our Convention of the Parties Public Opinion Poll (COP POP). We're partnering up with fellow students at Dickinson College to host a daily public opinion poll question. To find out more and to cast your vote, visit our polling site every day from December 7-18. Now comes the final and most important part of this semester-long journey. Through this blog, I'll do my best to keep you informed about the experiences me and my classmates will have as Student Delegates at the fifteenth meeting of the Convention of the Parties at next week's UNFCCC.